Greetings, fellow game lovers! I’m very excited to be writing my first ever Ronin Roundtable. Some of you may remember a few months back that Donna Prior introduced me as the new Events Manager when she moved over to Catan Studio. (We still miss you, Donna!) 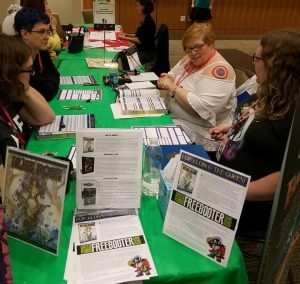 Since then it has been a whirlwind of Gen Con, the annual Green Ronin summit, and coordinating for all the additional conventions we’ll be doing in the next year. I’ve found Green Ronin to truly be “dedicated to the art of great games.” We are passionate bunch: about our games, social issues, our chosen family, and about the joy this art of great games brings. It delights us when others share that passion! Art is a skill of creative imagination meant to be practiced and shared; that is the basis of the Freebooter program. The Freebooter program has been around for a while, but due to Green Ronin being a small company, it has historically been difficult to maintain. Now that we’ve grown a bit, we have more resources to help support wonderful things like the Freebooters. So, we are striking while the iron is hot and doing an official relaunch of the program. And do you know what? I love running Green Ronin’s volunteer GM activities. I’m excited to help people enjoy games. (Sometimes I think I might get more out of helping others enjoy games than I do playing them myself.) I adore facilitating GMs finding a convention or Friendly Local Game Store to run games for people. It makes me happy to see people who’ve never met find common ground and joy over the gaming table. It’s one of the best feelings! Willingness to keep up to date with general program information and communications. Participants must be knowledgeable about the setting, be able to explain game mechanics, and answer simple questions regarding Green Ronin. Freebooters support an inclusive gaming experience. You must have a passion for gaming and the product you are looking to support. You must have a professional attitude and work ethic. Coordination, communication, cooperation, collaboration, and confidence are the guiding principles of being a Freebooter. Members are expected to run demos at hobby stores and conventions and raise awareness of the games in general. Submit event reports in a timely manner. May possibly be enlisted by Green Ronin to assist during large events. What Green Ronin game brings you joy? Are you drawn to the lush beauty of Aldea as portrayed in Blue Rose? Perhaps you hunger for more stories of Tal’Dorei now that Vox Machina’s campaign has ended. Or do you love to battle darkspawn in Thedas with Dragon Age? Maybe you yearn for your own sword and sorcery adventure in Fantasy Age. Does the piracy, and Lovecraftian horror of Freeport hold a special place in your heart? Mayhap you just want a light-hearted party game of finishing sentences courtesy of Love 2 Hate. Looking for an epic superhero story as offered by Mutants & Masterminds? Or possibly you hunger for the merciless, cutthroat intrigue of Westeros available in A Song of Ice and Fire. Did you love Wil Wheaton’s Titansgrave so much that you want to try the world out yourself? Or maybe you are a pirate at heart, interested in playing the fast-paced card game of Walk the Plank? Plus, Green Ronin is continually working on new game systems and settings. Coming up soon and/or currently in production are The Expanse RPG, Freedom City for Mutants & Masterminds, Mutants & Masterminds: Rogues Gallery, Fantasy AGE Companion, Ork! The Roleplaying Game, Second Edition, Faces of Thedas (Dragon Age), Modern AGE, World of Lazarus, Mutants & Masterminds Basic Hero’s Handbook, Return to Freeport, and the Sentinels of Earth-Prime card game. There are so many worlds to explore! You can share these wonderful, exciting experiences while making new friends and earning rewards through the Green Ronin Freebooter Program. By running games, you can earn GM experience points, which can be turned into credit in our online store. GM badge and/or partial hotel reimbursement at select conventions. If this sounds like fun, please apply. So, what are you waiting for? For more information, look at the Green Ronin Freebooter Information Hub or just fill out the volunteer Freebooter Application form. I look forward to meeting more new Freebooters. I’d love to help you find a place to start hosting games. Thank you for your interest in running games for Green Ronin Publishing! Questions? Email Veronica at events@greenronin.com. Happy Gaming!